Strawberry Mango Banana Smoothie turned Nice Cream Recipe. Want a quick and healthy dessert? 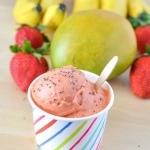 Try our Mango Strawberry Banana Ice Cream Recipe! It's vegan, all natural, fresh and delicious! In a high speed blender combine the fruit to make an ice cream. Using a tamper to drive the fruit down to the blade and once it's creamy and smooth enjoy. You could also use a food processor.